Piab designs innovative vacuum solutions that improve the energy efficiency, productivity, and working environments of vacuum users around the world. Piab develops and manufactures a complete line of vacuum pumps, vacuum accessories, vacuum conveyors and suction cups for a variety of automated material handling and factory automation processes. Piab utilizes COAX®, a completely new dimension in vacuum technology, in many of its original products and solutions. 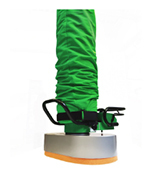 Piab offers one of the market's widest ranges of suction cups so that each application will have its own solution. Piab vacuum pumps/vacuum generators are predominately based on the patented COAX® technology, an advanced solution for creating vacuum with compressed air. Based on Piab’s multistage technology, COAX® cartridges are smaller, more efficient and more reliable than conventional vacuum ejectors, which allow for the design of a flexible, modular and efficient vacuum system. ​The entire Value Line® program consists of suction cups and vacuum ejectors. Value Line® suction cups are developed for standard/basic applications. The suction cups have a long thin lip and provide good sealing on slightly corrugated surfaces (such as corrugated cardboard). The Value Line® vacuum ejectors are available in three different designs. PMAT (Piab Modular Automation Tooling) offers adjustability and also rigidity with the same products. PMAT can be used to design robot end-effector tools, ergonomic tools or fixture tools for use on all types of automation equipment. Kenos® is a leading brand for large-area vacuum grippers. It is designed and optimized to be used in various applications e.g. packaging, wood, food etc. The product group represents a flexible solution for the handling manipulation of several products with different shapes, dimensions and compactness. Ergonomic handling solutions are available to meet the demands of all kinds of applications and can lift almost any type of product; parcels, baggage, sacks/bags, boards, glass, kegs/barrels, bottles, food, stone, windows etc. Depending on its purpose it is available in various number of combinations. You can lift almost everything. They're proven to reduce strain injuries, being user friendly as well as keeping top quality promises, it will increase productivity of the application. Clayton Controls is a Piab distributor in California. We offer technical support to help our customers solve their applications.